KWCardDesign : Lawnscaping Challenge # 21 - Thank You. I wanted to share with you my submission for this week's Lawnscaping challenge : Thank You. For my card I used Critters in Forest. I just love this owl. I actually just bought this set, as I am still growing my Lawn Fawn stamp collection. For this card - I did a "reverse stamping" technique. I actually learned the technique from Jess Larsen. I just love her tutorials. I wanted the owls to face one another. I also wanted to do some paper piecing for the tree stumps, and the belly of the owl. 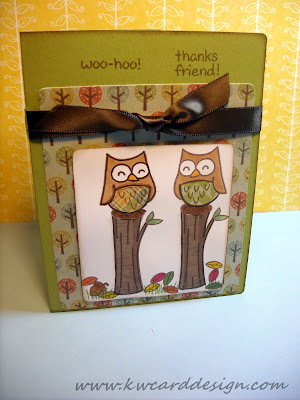 I used some patterned paper from the We R Memory Keepers collection called Autumn Splendor. This is one of my favorite 6 X 6 paper pads right now. I guess it is because of all the beautiful fall colors in the collection. I added some fall leaves and used my Copics to color them in, and added "grass" from the Critters in the Burbs set. Hope you all like it. Speaking of Thank you - Thank YOU for stopping by my blog!! This card is totally cute! I love how you turned the Lawn Fawn logs on their ends. They make great tree stumps! Thanks so much for playing with us at Lawnscaping! this is so stinkin cute, K! The colors are warm and cozy. I have seen that video of reverse stamping but haven't tried it yet, I really should give it a go! Thanks! Super cute Kari! I love this... Love that you flipped the logs up!!! Tee hee! Super cute. So cute you played along with us. Waaaaa the owl look so cute together, love the logs, great idea! Thank you for playing with us at Lawnscaping.